When your business depends on data, manually collecting information from complex and dynamic websites is neither scalable nor cost-effective. 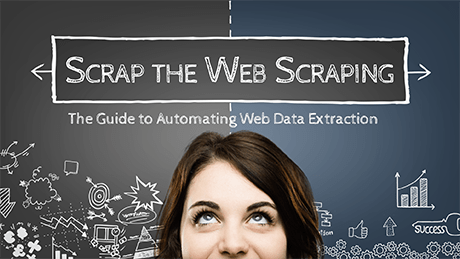 A simple web scraper tool can create more problems than it solves when it can’t access dynamic content, breaks when websites inevitably change and can’t filter out unwanted information. What you need is intelligent software robots that automatically interact with and pull data from disparate websites and portals—and then deliver it in near-real time, constantly updating and integrating the data with your systems and decision-making processes. Grow market share, transform your industry, defend your brand, protect citizens…what can your organization do with timely, accurate and complete web data? Automatically extract data from any website or portal. Eliminate manual efforts or complex scripting. Filter, transform, normalize and aggregate precise and complete data. Integrate external web data with any enterprise system, database or process. Gain insight, gain a competitive edge, ensure compliance and deliver operational excellence. In the past, it could take anywhere from 30 minutes to five hours to schedule an appointment. With Kapow, we have cut the time taken to set up an appointment to just five minutes on average—and we can even schedule some deliveries in as little as half a minute, which is just incredible. When you automate the entire process of web data acquisition, transformation and integration with business systems and processes, you unlock valuable insights that keep your organization competitive and agile.